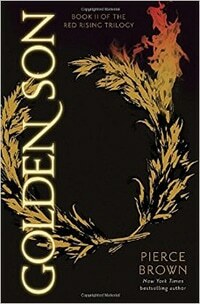 Golden Son, the sequel to Martian class-war dystopian Red Rising, is finally here — and fans of the first book’s bloody battle royale should be very pleased with Part 2. If, like me, you’re a little fuzzy on the details of what happened in Red Rising, this synopsis should get you mostly up to speed before we discuss the second book. To quickly summarize the events of Red Rising: in a world where humans are genetically modified and color-coded (including their skin and hair) as part of a rigid caste system, Darrow grows up as a Red miner deep under Mars’ surface. Reds are worked to the bone in harsh conditions — to mine crucial elements for manning a return journey to Terra, humanity’s long-lost planet of origin, or so they’re told. But after Darrow’s 16-year-old wife martyrs herself in an attempt to kickstart a revolution, he fakes his own death and joins the underground terrorist group called the Sons of Ares. Through a grueling ordeal of plastic surgery and genetic tweaking, Darrow is transformed into a Gold, the most elite social class and the lords of the universe. His job is to go undercover and infiltrate Gold society, helping the Sons of Ares destroy the system from within. But when Darrow enrolls at a bloodthirsty military academy for teenaged Golds, he learns that they’re not all the evil monsters he’s always heard about — especially his core group of trustworthy, courageous, and strongly principled friends. As Red Rising concluded, Darrow had just joined Archgovernor Augustus’ house, moving ever closer to the seat of power: the Sovereign’s throne. Now, two years later, Darrow has continued his studies at the war academy, where he’s a rising star. The archgovernor’s real son, Adrius, aka the “Jackal,” is a crazy and amoral nutjob who only cares about his own interests; the archgovernor’s daughter, Mustang, is Darrow’s untouchable love interest, who can never know the real truth about his origins. But things have gotten much bigger than teens hacking each other to death at a military Hogwarts — the powerful Gold houses are beginning a real, interplanetary war to take control of the Sovereign’s throne, and Darrow must choose a side. Meanwhile, the Sons of Ares finally break their silence and contact Darrow, but can he still trust their agenda after years of being left out in the cold? As previously mentioned, it had been a while since I read Red Rising and I falsely assumed I remembered the plot pretty well, so I didn’t bother to revisit the events of the first book. Do not make this mistake! Unless you’re going straight from the first volume to the second, it’s well worth a quick refresh. Otherwise, all the details of which clans are feuding with which, and who’s holding a grudge over which brutally slain relative, will all be a big rainbow-colored blur and you’ll be confused for half of book 2. Ask me how I know. Once I finally sorted out what was going on, the situation improved, but I still ended up feeling that this epic space-opera saga is starting to buckle under the weight of too many forgettable minor characters with ridiculously overwrought ersatz-Roman-Empire names. Time jumps of several years don’t help with the disjointed feel of the narrative. Brown has done an interesting job of muddying the waters and raising the stakes so that everyone has blood on their hands and no one is above the selfish desire for power, but this moral ambiguity also makes it harder to know (or care) whose side we’re on. I want to believe that Brown knows where he’s going and it’s all going to come together neatly in the final book of the trilogy, but it could just as easily spin out of control into a tangled mess of too many subplots, double-crosses, and surprise twists. If you enjoyed Red Rising but really wished it could be more complicated and involve a bunch more characters, you’re going to love Golden Son. I had mixed feelings after finishing this book, but I’m invested enough to follow the trilogy to its end and hope that it all makes sense when we get there.